The ChargeMaster Combo features the ChargeMaster 1500 Scale and ChargeMaster Dispenser, preassembled to form an unmatched combination of speed and accuracy. There is no longer a need for timely calibration to the type of powder being used. Simply fill the 1 lb+ capacity powder hopper with smoke- less powder, enter the desired charge and press the dispense button. Average dispensing time is under 30 seconds for a 60 grain extruded powder charge. Dispensing can be done in grains or grams mode. 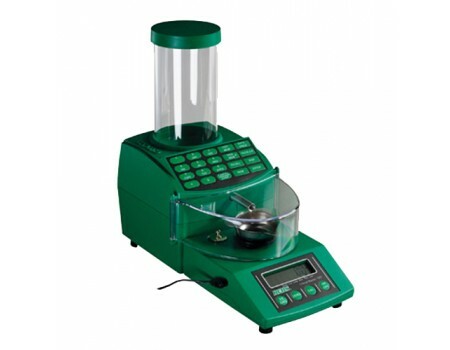 Accurately weighs and dispenses all extruded (stick), ball (spherical) and flake smokeless powder from 2.0 to 300 grains to +/- 0.1 grain. You can store up to 30 of your favorite loads in memory for fast easy recall. The front to back layout allows easy access to the scale pan by right or left handed users. The clear cover eliminates fluctuations in weighing caused by air currents without obscuring your view of the charge being dispensed. The powder drain feature allows for convenient and easy emptying of the powder hopper. Power to the Dispenser is provided by the connection to the ChargeMaster 1500 scale so there is only one power cord to manage.